Hyaline cartilage is a type of connective tissue composed of specialized cells in a translucent, pearly blue matrix. Hyaline cartilage thinly covers the articulating ends of bones, connects the ribs to the sternum, and supports the nose, the trachea, and part of the larynx. It is covered by a membranous perichondrium, except where it coats the ends of bones, and tends to calcify in advanced age. It is found on many joint surfaces. It is pearl-grey in color with firm consistency and has a considerable amount of collagen. It contains no nerves or blood vessels, and its structure is relatively simple. Hyaline cartilage is the most widespread and is the type that makes up the embryonic skeleton. It persists in human adults at the ends of bones in free-moving joints as articular cartilage, at the ends of the ribs, and in the nose, larynx, trachea, and bronchi. It is a glossy blue-white in appearance and very resilient. 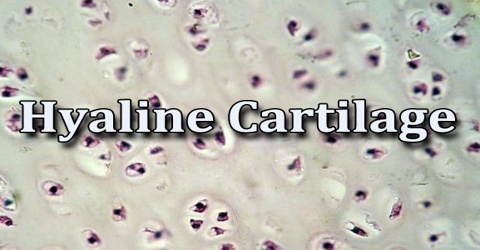 Hyaline cartilage is the most abundant type of cartilage in the body. It is covered externally by a fibrous membrane, called the perichondrium i.e. ears and nose, and also at the articular ends of bones where it is internal to the joint cavity which is defined by a fibrous joint capsule lined with synovium. 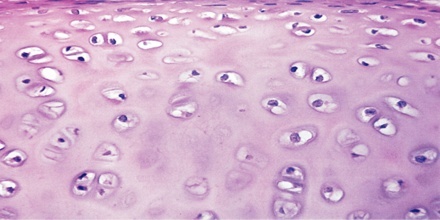 This membrane, perichondrium or synovium, contains vessels that provide the cartilage with nutrition through diffusion. The hyaline cartilage in the trachea is in the middle of the tracheal wall. It tends to stain more blue than other kinds of connective tissue. Hyaline cartilage matrix is mostly made up of type II collagen and chondroitin sulphate, both of which are also found in elastic cartilage. It exists on the ventral ends of ribs; in the larynx, trachea, and bronchi; and on the articulating surfaces of bones. 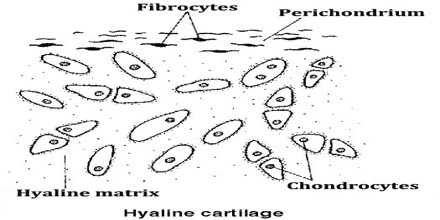 Hyaline cartilage has very few fibers in its matrix, so the matrix usually looks smooth. It is very uniform in appearance. It is surrounded by a membrane called the perichondrium, which provides nutrients to the cartilage since the cartilage tissue has no blood vessels of its own. Articular cartilage is hyaline cartilage on the articular surfaces of bones. As such, it lies inside the joint cavity of synovial joints, bathed in synovial fluid produced by the synovial membrane that lines the walls of the cavity. Hyaline cartilage is high in collagen, a protein that is found not only in connective tissue but also in skin and bones, and helps hold the body together. It provides support and flexibility to different parts of the body. It is found in structures like the nose, ears, and areas where the ends of the ribs attach to the sternum, and in parts of the respiratory system like the trachea and larynx, where it helps give these parts their form but also gives them some flexibility. Reference: thefreedictionary.com, britannica.com, biologydictionary.net, wikipedia.